- Europe's Emissions Trading Scheme unites the 25 states of the European Union in an attempt to cut emissions of the gases fuelling climate change. 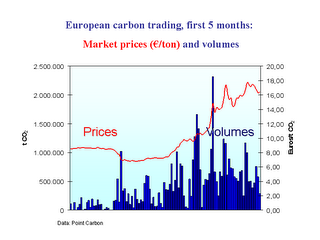 - What is carbon trading? - Since the beginning of 2005, about 12,000 energy-intensive plants in the EU have been able to buy and sell permits that allow them to emit carbon dioxide (CO2) into the atmosphere. - Companies that exceed their individual limit are able to buy unused permits from firms that have taken steps to cut their emissions. - Those who exceed their limit and are unable to buy spare permits are fined 40 euros (£27) for every excess tonne of CO2. Industries included in the Emissions Trading Scheme (ETS) include power generation, iron and steel, glass and cement…about 40% of the EU's total CO2 emissions. - Has it been successful? - …Organisations such as the UN and the World Bank have praised the ETS, and say it can form the basis of a global system…in practice, the ETS has had a rough ride. Nations have issued more permits to pollute than required in the first phase, which runs until the end of 2007….carbon prices [fell] as low as eight euros (£5) per tonne. This means that it has been cheaper for firms to buy spare permits than pay the 40-euro fine, or take steps to reduce their emissions…Environment Commissioner Stavros Dimas has said the EU had to show leadership if it was to convince other nations, especially Australia and the US, that carbon trading schemes worked. 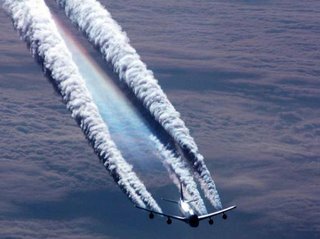 Why is aviation now being included in the ETS? - EU emissions from the international air transport sector are increasing faster than any other sector…an 87% increase in CO2 since 1990…taking a return flight from London to New York will generate about the same amount of CO2 as an average person heating their home for a year…the ETS will cover commercial flights within the EU from 2011, and all flights to and from the EU in 2012. Domestic flights (eg. London to Manchester) are already subject to national limits set by the Kyoto Protocol. - Airlines favour carbon trading rather than taxes on fuel or emission charges. - Australia's Prime Minister John Howard has set up a task force to look at carbon trading…Such a move could pave the way for an international carbon trading scheme to form the central pillar of a post-2012 Kyoto agreement.